Prozyme® Plus is a unique, scientifically proven, all natural, enzymatic food supplement. 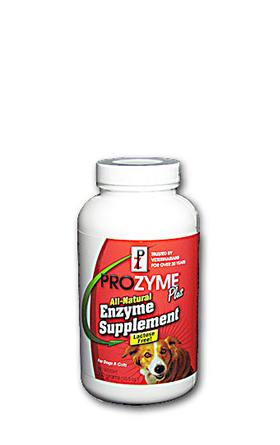 It provides your animal with digestive enzymes that are destroyed in the cooking or processing of food. The addition of Prozyme® Plus allows greater absorption of the important nutrients found in your pet’s food and aids digestion. Prozyme® Plus is a combination of four highly concentrated and purified natural plant-derived enzymes (lipases, amylases, proteases, and cellulases). Prozyme® Plus is beneficial for all pets whether your pet is a dog, cat, bird, horse, rabbit, ferret, ostrich, or exotic pet. One 300 gram container will last a 10-pound (4.5kg) cat over two years or a 44-pound (20kg) dog 8 months. Add ¼ teaspoon per cup of food. If your animal is over 8-years of age, the recommendation is to add ½ teaspoon of Prozyme® Plus per cup of food. In that case, the supply will not last as long as previously stated.